We had our own personal tour guide in Fox today. Previously a diligent and hardworking Patroller at Ohau, as the summer rolls in Cam’s seasonal snow chasing job transform into… well… actually more snow chasing! Only up high on New Zealand’s glacial mountains. He made full use of the spring time downpour the West Coast was experiencing, and used his day off to bring three hardened adventure babes out into forbidden hiking territory. Jumping a fence, we headed down the now disused path called the Chalet Lookout Track. 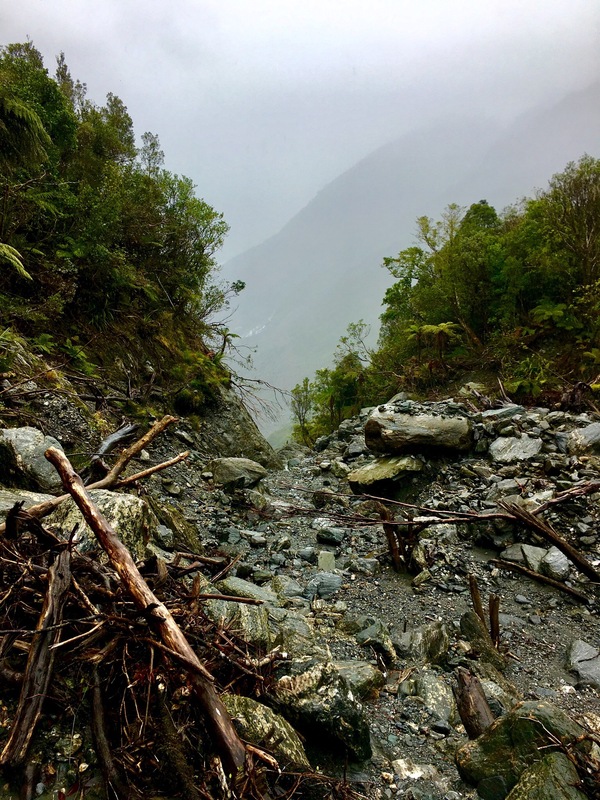 The DOC site association had closed this route previously as due to natural flooding and landslides the pathway and bridges were smashed to pieces. These bridges and pathways now littered with fallen trees and swept up boulders were originally used by horse and carts in the 1950s. The wealthy lords and ladies dressed in petticoats would make the journey from their hotel to a hut and tearoom called Chalet Lookout. From the Chalet Lookout, which is now just a wooden platform, they could enjoy their day walking or riding along the surface of the Fox Glacier. Dirty grey rivers from the extra rainfall streaked the rock field, which made it tricky to cross. Alex and I being super polite individuals, and much to her appreciation, let Lauren go first to scale a loud gushing river of mud sludge and rolling stones. After about 20 minutes of test jumps and encouraging “i’ll catch you!” reassurance/videoing from Cam, Lauren made it across with no trouble. I went straight in for the build-a-smaller-gap-by-building-a-stone-bridge attempt. One which would have worked had I used larger rocks that didn’t all sweep away from under my feet… leaving me ankle deep in the sludge. Again. Alex went for the damsel-in-distress approach. Looking all cute and nervous, Cam rolled his eyes and came in to the rescue by carrying a gigantic boulder and smashing it into the centre of the stream. The perfect stepping stone for the Lady to cross. Alex and I wearing red lichen as war-paint! After maybe a couple hours of leisurely scrambling, we made it to the platform, and were shocked to see where the glacier was now. From this sight, you could see where the glacier had retreated from, as the tree line stops abruptly making a scree channel toward the existing ice. As the glacier retreats, landslides happen and whole forests on a now unsupported landmass slide down towards the base of the valley. There are guided walks that go right up to the glacier along the pathway along the left side of the valley. For enthusiasts that want to get so close they can touch it. …Or steal a little bit of glacier to make a glacial cocktail, as recommended in NZ Frenzy’s guide to the South Island book . …honestly, I can’t really remember any more useful Fox facts after the half-glass of wine kicked in. …Disco lights reflecting off joyous faces dancing with 2000’s pop rock in parts came back to me. Flashbacks of Alex’s grey face and carrying a used sick bucket back to the venue kitchen… and Lauren’s American smile larger and whiter than I’ve ever seen it before. We waved goodbye to our new Fox family, relieved to see their living room floor again, packed up Subie, and left.